Gee Infra Tech - Manufacturer of landscape designs, water fountains & designer sculpture in Gurgaon, Haryana. Landscaping is nothing but modifying the outer features of any land or surroundings in such a way so as to make it aesthetically beautiful and charming. Any outer space at your home or office can be turned into a sparkling place with the right techniques and tools. Grand Designs (P) Ltd. provides extensive services and products in the field of Landscaping. We strive to make your surroundings greener and cleaner by using innovative techniques and processes. We have the experienced professionals that will ensure timely service and superior quality for all your landscaping needs. 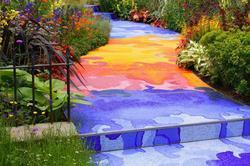 Landscaping by Grand Designs (P) Ltd. involves provision of excellent garden designs by our experts. We provide different designs according to the needs and location of your home and office spaces. We will give you the garden that reflects your personality and taste with our fine consultation and designing processes. Our experts will create the design according to your requirements and constraints. Landscaping of gardens for your home and office will be carried out in a systematic process to match your expectations. The garden area provides the aesthetic value to your place like nothing else. A clean and well organised garden will help in improving this value in an effective way. Landscaping needs may involve the redesigning of your garden, restructuring of garden places and addition of various new elements in your gardening spaces. This is carried out under special consultancy by our experts and specialists. Regeneration of your garden will involve adding new shrubs, hedges, plants etc. Grand Designs (P) Ltd. is a leading company for the landscaping needs and we are currently working in North India region efficiently. Our designers and experts will give you the right solution for your needs. The professionals provide you the perfect design for your garden and make your living and work place visually fascinating. Water fountain can increase in the value of your land. Water fountains add a peaceful sound to the garden and can even provide decorative accents to your home. Fountains can be constructed out of a variety of materials to complement the look of the home.An fountain will add instant beauty to your surroundings. Whether it is a large wall fountain, a tabletop fountain or a garden fountain, you are decorating and showing your style. Water fountains are the kind of element that can add on to the landscaping features in a unique way. When used carefully in combination with other elements like sculptures of your garden, a correctly designed and constructed water fountain gives the best appearance to your garden and the fountains give the environment a tranquil feel required in a garden always. Grand Designs provides you with professional expertise if you are looking for addition of a water feature to your patio. These can be royal and majestic fountains, waterfalls, small ponds or creeks and different kinds of aquatic plants. All these features can be used in a perfect combination to provide you with the ultimate garden space. Fountains are becoming very common in the business outdoors as well. The corporate places need the perfect ambience and a fountain provides the amazing combination of cool and dynamic living. 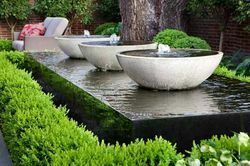 Fountains can bring about the required balance in your garden space with natural and cool aesthetics. So if you are in the quest of the best landscaping features, water fountains will be the finest option available. A royal fountain gives your garden a luxurious touch throughout. We can even make the use of water gardens, bubbling rock fountains and different pottery fountains for completing the landscaping of your garden. Grand Designs will you the required material, designers and technicians needed for the implementation and support. You don’t have to worry about your needs of landscaping now. Just reach us and we will deliver the best in class services and products. 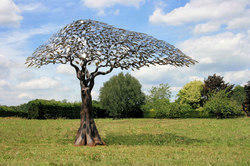 Sculpture is an art of producing in three dimensions representations of natural or imagined forms. It includes sculpture in the round, which can be viewed from any direction, as well as incised relief in which the lines are cut into a flat surface. Sculptures make a special part of landscaping as it acts as an addition to the garden or outer space and acts like a fabulous attraction of your scenery. Grand Designs (P) Ltd. will provide with all kinds of sculptures for every kind of occasion and place ranging from sculptures for your gardens and homes to different spaces of your business places. Sculptures can come in different materials like Iron sculptures, Metal Sculptures, Ceramic Sculptures, and Steel Sculptures etc. Our team of designers and experts in landscaping will help you to decide and pick the best option for your requirement. These sculptures make the garden complete and exhibit amazing message for your business unit. The corporate are widely using these sculptures to make aesthetics of workplace classy and refined. You can pick and choose your favourite kind of sculpture form the wide range of dazzling sculptures available for you. This can include some random designs on the plaques, the fruits sculptures like Big Apple, Pear etc. for your garden and different sculptures working with the water ornaments complete the aesthetics of the space. We can even have outdoor fires, garden art, different sizes of pots and specially made shade umbrellas to add on to our terrace, garden or the office premises. These aesthetic sculptures give you the freedom to express yourself through your landscaped gardens with the wide variety of designs available to you.